Now you have to register your KYC. Everyone is required to complete KYC to participate in our ICO. KYC is required because we want to stop those involved in money laundering, funding terrorism and other crimes from joining this ICO. We need to check your identity. After you register KYC, we are going to check in MAX 3 days. Please login afterwards and check on ‘My Page’ to see your verification status. Find out how you can register for KYC below. 1. Go to My Page and click on KYC. Insert your information below. 2. Upload copy of your passport, identity card or driver’s license. Be sure to cover important numbers manually(paper recommended) except your birthday. Do not use Photoshop or Pain or other digital programs to cover this information. Below are the cases where your KYC will be rejected. 3. Upload a photo that shows your face and your identity card, passport of driver licenses well. 4. You have registered your KYC now. See the results in three days on My Page. Last time we talked about how to make an Ethereum Wallet using MyEtherWallet. Today we are back with registering your Ethereum wallet to Metamask. 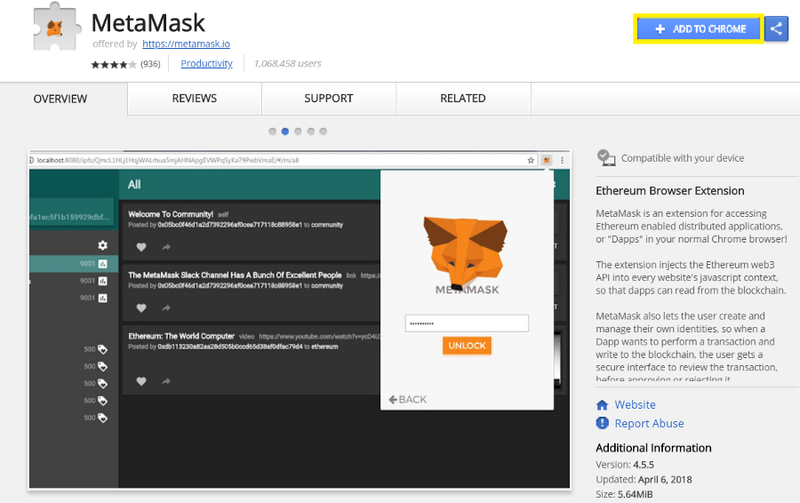 MetaMask is a Google Chrome Extension in which you can safely and conveniently manage your Ethereum wallet. You can use MetaMask to send / receive Ethereums, and you can also check your MVL Tokens that you are going to receive from us in future. 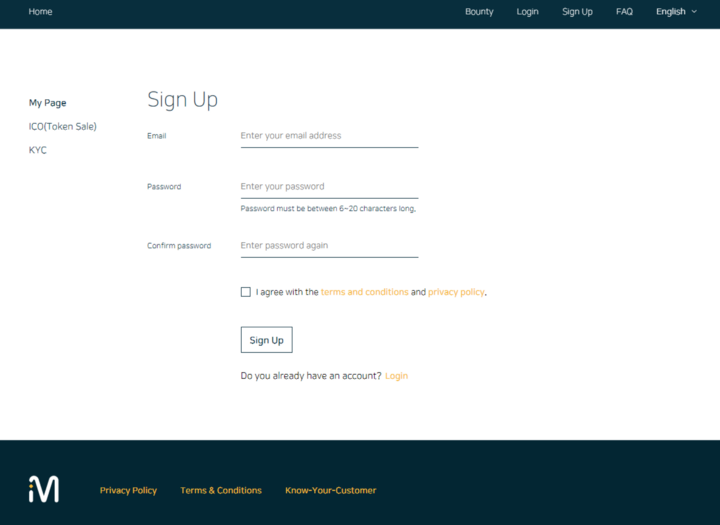 Next you have to import your MyEtherWallet account. Click on the human icon located on the upper-right side, and click on ‘Import Account’. 7. Choose ‘JSON File’ for ‘SELECT TYPE.’ Next, click on ‘Select File’ and choose the Keystore File that you previously created at MyEtherWallet. Then insert your Keystore File Password that you have created at MyEtherWallet, and click on ‘IMPORT’. 8. Now you can use Metamask to manage your Ethereum wallet! You can see your MyEtherWallet account icon is written with ‘IMPORTED’. This is going to tell you how to make an Ethereum wallet, using MyEtherWallet. 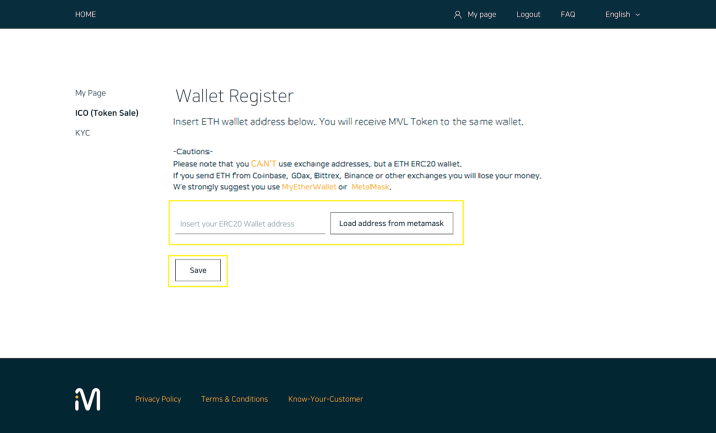 There are a lot of websites where you can make your Ethereum wallet, but we are going to use MyEtherWallet, since it is safe, convenient, and well-known. 2. This is the page you will face in the first stage. It just suddenly asks you to ‘Enter a password’. Here you should insert a password that you usually use, since this password will be used to unlock your Keystore File. Then click on ‘Create New Wallet’. 4. Then, your Private Key will be shown. Please keep this in a safe place, too. Click on ‘Save Your Address’ afterwards. 5. Click on ‘Keystore / JSON File’ and select the Keystore File you saved at the previous step. 6. Enter the password you had set in the first step and click on ‘Unlock’. 7. Finally, your Ethereum wallet is made. You can send / receive Ethereums with this wallet. Please scroll down, and you can see your wallet address. Congratulations. 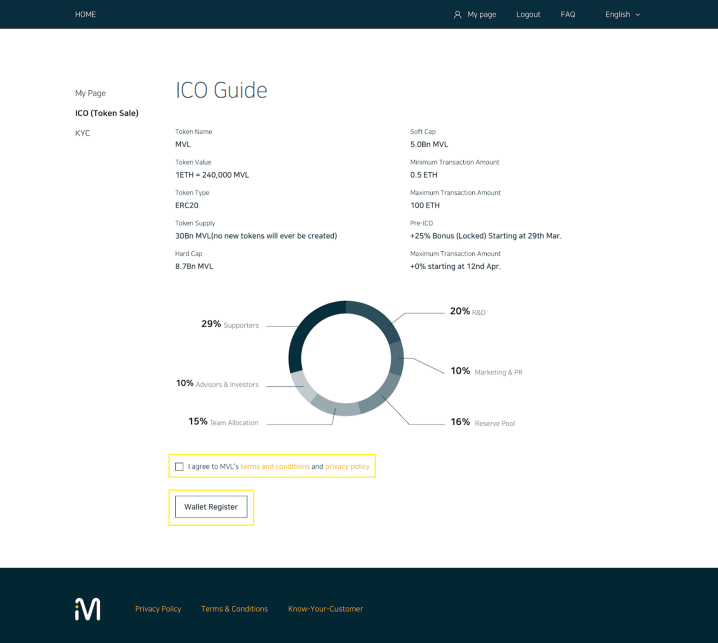 * You can register this wallet address at your ‘My Page’ in our MVL Official Homepage (https://mvlchain.io). MVL Airdrop is now Live! MVL team is hosting an Airdrop Event. You can get MVL Tokens! Win 210 MVL Tokens everyday, just by signing up, registering wallet and KYC on our website! This event will be held only from 18th April to 17th May(UTC+9). We offer 25,000,000 MVL Tokens MAX, with a value of over 100ETH for Event 1. Event 1 will be terminated immediately if 25,000,000 MVL Tokens are exhausted before the end of the event. Event 2 continues until our further notice. Author adminPosted on April 18, 2018 April 19, 2018 Categories EnglishTags Airdrop, Blockchain, Bounty, Chain, Cryptocurrency, ICO, Mobility, MVL, MVL Ecosystem, MVLchain5,536 Comments on MVL Airdrop is now Live! As you all know, our pre-sale starts very soon on April 26! In preparation for that, we have made a very easy-to-follow guide, informing you how to participate. In order to participate, follow the instructions below one step at a time. The individual links will guide you to carry out the step. If you have already covered one of the steps, you can move onto the next one. 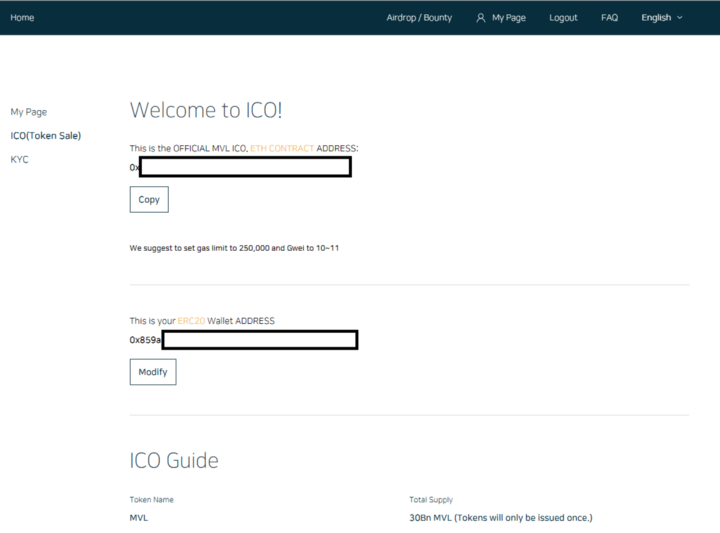 When our Pre-ICO begins, our wallet address will appear at the homepage -> My Page -> ICO(Token Sale). You can then use programs like MetaMask to transfer ETH to MVL wallet address. If you have any questions or problems along the way, join one of our MVL channels listed below to ask us questions. MVL Whitepaper, One Paper Updated! We have updated our whitepaper(v1.1) and one paper. We wanted to make it extra clear about our Mining Pool in our infographic. We have made it clear in the image that MVL Pool and Mining Pool are separate. Other updates include minor wording changes and typo corrections. We will be back with more news. Until then, be happy. Worry less. Author adminPosted on April 18, 2018 April 19, 2018 Categories EnglishTags Airdrop, Blockchain, Bounty, Chain, Cryptocurrency, ICO, Mobility, MVL, MVL Ecosystem, MVLchain1,732 Comments on MVL Whitepaper, One Paper Updated! The founder of MVL, Kay Woo, has been traveling all over Asia. He is meeting people from all over the world to make our MVL family bigger and bigger. But, we want to share this news with you as you are also part of the MVL family. Today, we will share who he has been meeting in Japan! A Truly amazing and powerful woman in the Japan crypto community. She is part of Money Partners and the coin exchange associations. At this meeting, she has provided with great advice and guidance. Hiro is the Co-founder & CEO of Hotaru Inc! Hotaru Inc. discovers talent with great ideas, nurtures their ideas, and connects them with those who want to support innovation and social impact. He shared his visions with us to inspire us of building a connected world. Next time, we will share more stories about some of the other people Kay met!